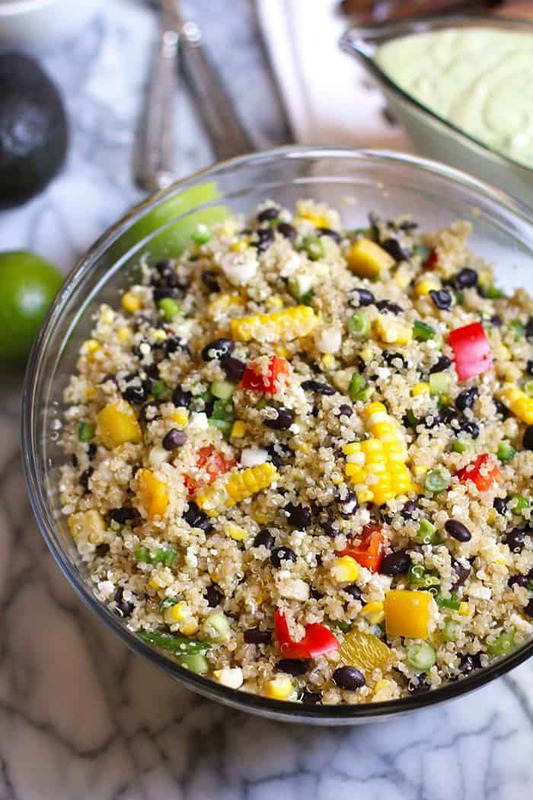 Mexican Quinoa Salad is a new family favorite. 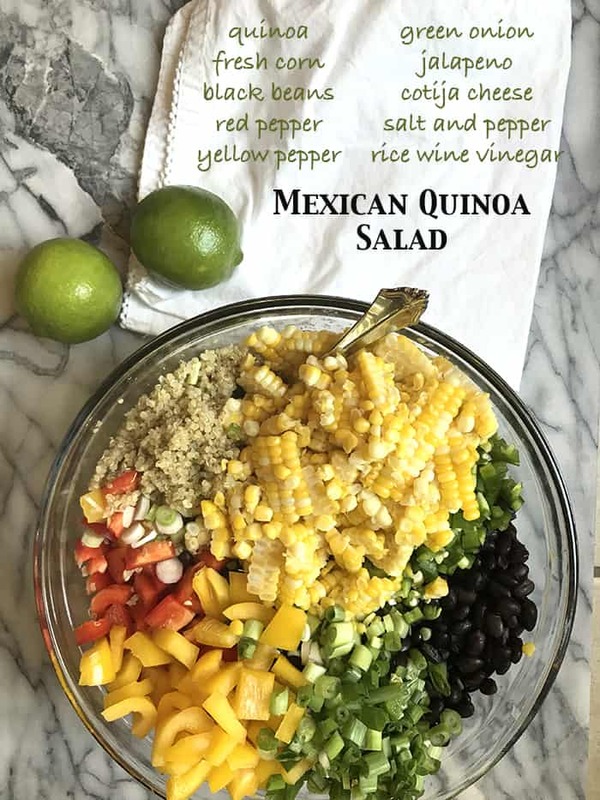 Protein packed with two cups of quinoa, black beans, peppers, jalapeños, green onions, fresh corn, and Cotija cheese – topped with rice wine vinegar and the AMAZING Creamy Avocado Dressing! 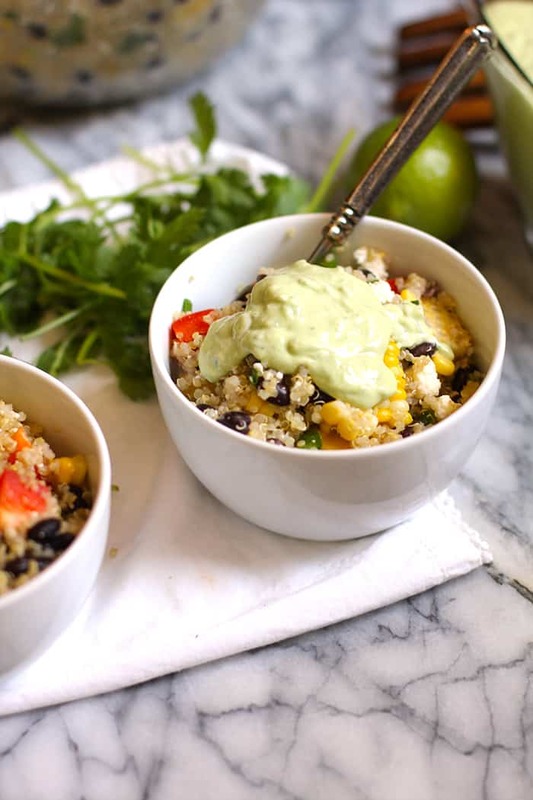 Using two cups of raw quinoa ends up to be about 6 – 7 cups after cooking. With the addition of all the veggies, this salad makes a huge bowl. It lasts several days in the refrigerator, but you could easily cut the recipe in half. Fresh corn on the cob is key. I boiled four ears and cut the corn kernels off of the cobs. 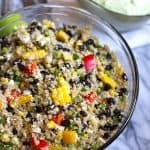 The crunch absolutely makes this salad – don’t use canned! The Cotija cheese is a Mexican (crumbled) cheese, that is really important for flavor. You can find it at most grocery stores. I added the rice wine vinegar to the salad for flavor, but mostly to keep the quinoa from sticking together. My Creamy Avocado Dressing is added right before serving. You can also warm up individual servings of this salad. My family likes it cold, but I like it both ways. The rice wine vinegar DOES give the salad a nice flavor. But my Creamy Avocado Dressing gives it an OUTSTANDING flavor! It’s totally worth making, and it stores well in the refrigerator too. I just throw it all in a food processor and it’s done in a few seconds. I love eating salads in the summer. In fact, I crave them! And it’s a very good thing, cuz crazing salads instead of nachos is better for the figure. We are now IN shorts and swimsuit season. That means it’s time to lighten up, and get our salads on. * Rinse the quinoa in cold water. In medium pan, bring chicken broth to a boil, and add quinoa. Bring to rolling simmer and cook until the liquid cooks out. When done, pour quinoa into a large bowl. Set aside. * Boil corn by bringing water to a boil - in a large saucepan. Then add corn and salt. Cover and turn off the heat. Set timer for 15 minutes. When done, remove corn to cool. Rinse and drain black beans. Dice up the onions and pepper. Cut the corn kernels off of the cobs. 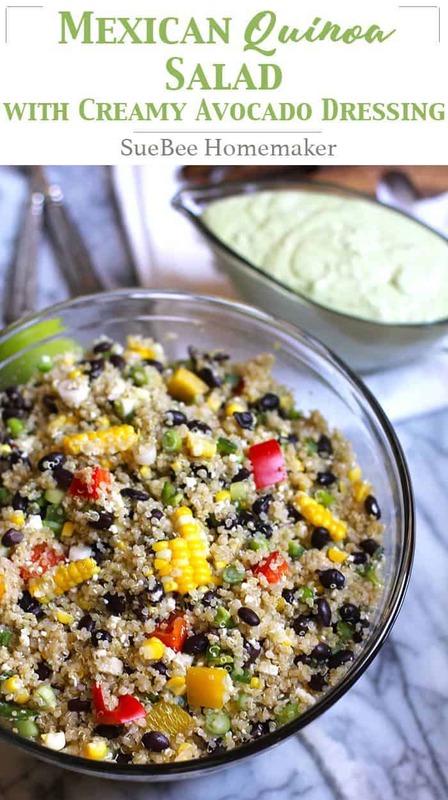 When quinoa and corn are cool, combine all salad ingredients in bowl, add rice wine vinegar, and store in refrigerator. Place avocado, greek yogurt, cilantro, jalapeño, salt, pepper, and lime juice in food processor. Add olive oil and if necessary to thin out, add water. This is a large recipe. For a smaller recipe, cut it in half. I love simple and healthy! I eat this recipe all the time, but it is a great summer lunch. So refreshing!